Sunday, March 25 marks what would have been the 77th birthday of the late great Gabriel “Flash” Elorde one of only two Filipino fighters – the other being Pancho Villa – enshrined in the Boxing Hall of Fame. 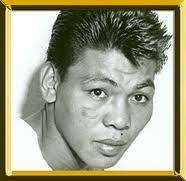 Elorde was born to a poor farmer’s family in the town of Bogo, Cebu on March 25, 1935, the youngest of 16 children. He was forced to leave school at a young age and worked as a pin boy at a bowling alley in Davao. An excellent boxer, the famed southpaw became an oriental champion at all weights from bantamweight to lightweight. After avenging a loss to Little Dundee with a 4th round knockout in Davao City in his first defense of the Philippine bantamweight title which he had earlier won in a rematch with Tanny Campo on July 26, 1962, “Papa” Sarreal convinced Elorde’s manager at that time, Nick Laurel, to send Elorde to Japan along with his trainer Cely Villanueva. Elorde won the OPBF bantamweight title from Horishi Hiroguchi on October 18, 1962 in Tokyo with all three Japanese judges scoring the fight in favor of the 17 year old Elorde who captured the imagination of Japanese boxing fans. After moving up in weight to capture the Philippine junior lightweight championship from Tommy Romulo Elorde set the stage for one of his most memorable ring battles. It was July 20, 1955 when Elorde stunned the boxing world by outpointing featherweight champion Sandy Saddler regarded as one of the dirtiest fighters in the business, in an action-packed, ten round non-title fight in Manila. Elorde dared to face Saddler in a rematch at the Cow Palace in San Francisco on January 18, 1956 for the American’s featherweight title. Elorde boxed brilliantly and appeared to be heading for victory when the referee called a halt in the 13th round because of a nasty cut suffered by Elorde as Saddler laced, poked, elbowed and pawed the young Filipino in an ugly display of viciousness in the ring. Elorde didn’t get another title shot for the rest of the decade but stayed a ranked contender. Eventually, after winning the Philippine lightweight title Elorde added the Oriental lightweight belt to his trophy room, just one month later by whipping Hideo Kobayashi in Nagoya. On March 16, 1960 at the inauguration of the Araneta Coliseum which was to become the “Mecca” of Philippine sports and entertainment, 30,000 screaming fans were thrilled as Elorde scored a spectacular 7th round knockout victory over world junior lightweight champion Harold Gomes of the US. It was a day of national rejoicing. Laura Elorde who didn’t watch the fight as she was pregnant at the time recalled that the fire trucks in San Juan where they lived, raced around town with sirens blaring in celebration of Elorde’s classic victory. A ticker tape parade through downtown Manila and a courtesy call on President Carlos P. Garcia at Malacanang Palace highlighted the weeklong celebration even as Elorde became an overnight national hero. In a rematch five months later Elorde reasserted his ring greatness with a crushing first round knockout over Gomes who years later told us during a Manila visit as special guest at the Annual Flash Elorde Awards Night and Banquet of Champions that he didn’t know what hit him. The knockout of the hapless Gomes was one of the quickest in boxing history. Elorde, to this day, holds the junior lightweight division record for the longest title reign of nearly seven-and-a-half years, defending the crown 10 times against the top contenders before losing a majority decision to young Japanese Yoshiaki Numata on June 15, 1967 with Numata resorting to hit-and-run tactics to win the fight. Elorde was renowned for his boxing skills, speed and ability to slip punches. Writer Robert Lipsyte once described Elorde’s style as the "subtle little temple-dancer moves". In one of the most compelling fights against former world lightweight champion Ismael Laguna of Panama, Elorde dropped Laguna once in the 3rd round and once in the 9th to win a ten round decision. As boxing promoter and manager Lito Mondejar said years later, both men left something in the ring that night and were never the same again. Elorde clashed with lightweight champion Carlos Ortiz who had won the title from Laguna and had the Puerto Rican in trouble in the 7th round but couldn’t put him away with Ortiz winning by a 14th round TKO which was bitterly criticized by “Papa” Sarreal at the Rizal Memorial stadium. In a rematch at New York’s famed Madison Square Garden which we covered “live” on dzHP Radio from a special ringside seat, Elorde won only one round before being bludgeoned in the 14th by a thundering right which sent him crashing to the canvas, flat on his back to be counted out for the first time in his career. The WBC under its president Jose Sulaiman named Elorde and stylish Alexis Arguello of Nicaragua the two best junior lightweights on the 20th anniversary of the organization at a gala New York affair some years later. Elorde made a few movies including one with the country’s top box office star Fernando Poe Jr. He became a prominent commercial endorser, especially for San Miguel Beer who along with its SMC owned Coca Cola consistently supported Elorde’s fights. His San Miguel Beer commercial (together with comedian Bert “Tawa” Marcelo and popular entertainer Rico J. Puno) with the unforgettable line , ".... isang platitong mani" (one plate of peanuts), was named the No.1 Filipino advertisement of all time. We were at Elorde’s bedside when he died of cancer shortly after 1:00 a.m. at the Lung Center in Quezon City on January 2, 1985. He was 49. Elorde became the first Asian inducted into the New York-based International Boxing Hall of Fame in 1993 and was also enshrined in the World Boxing Hall of Fame.. Both Ali and Frazier accepted an invitation to attend the cornerstone laying ceremony for the sports complex Elorde was building on a 4 hectare lot on Sucat, Paranaque. When the complex was completed and young boys who wanted to become boxers came to seek his help Elorde never turned anyone away. If they couldn’t make it as fighters Elorde and Laura gave them some job at the complex. Besides being a good and decent family man Elorde was also deeply religious. He built the St. Rita Chapel along Sucat Road and actually helped in the construction work. Elorde attended Mass every morning when the chapel was built and served as an altar boy. Even when he did his roadwork in preparation for a fight he would ask his brother in law Jun Sarreal to drive him to Roxas boulevard Elorde would jog all the way to the Baclaran Church and pray before going home to rest. As we remember him on his 77th birthday today at a Mass beside his tomb at the Manila Memorial Park and in the evening pay tribute to him in the 12th Annual Gabriel “Flash” Elorde Awards and “Banquet of Champions” at the Dusit Thani Hotel it is indeed fitting that perhaps the greatest fighter of all-time, reigning pound for pound king and “Fighter of the Decade” congressman Manny Pacquiao be the guest of honor and speaker. As the Elorde family honors our roster of current world, regional and national champions we can almost see “Flash” smiling down from the heavens above because like he told us years ago, nothing pleased him more than to show the world that Filipinos were great champions and a tribute to the sport of boxing.